Following on from our gtg today, I am writing this as a special thanks and sort of review of the loan watches we had today. I will start by saying I am not in any way affiliated with either brand, this is just comments, opinions and pics from the day. I have to give a very big thanks to Elshan from Zelos/Ventus and Rogier from Pheidippides Watches for the loans and Brad from reaching out to them. Rogier made the trip specially from Holland today and I hope he felt welcomed and enjoyed it. I will start with Rogiers watches. The main attraction was the Hourglass. 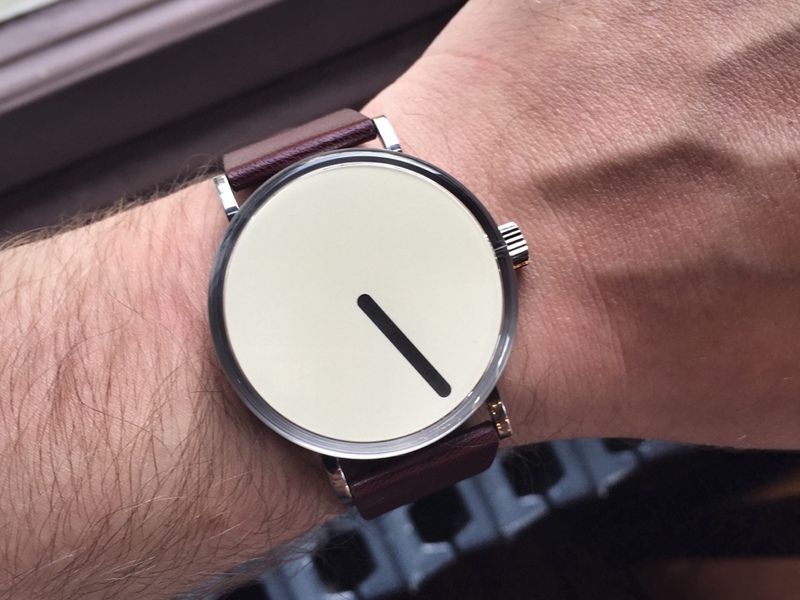 An unusual and interesting take on the 1 hand watch. 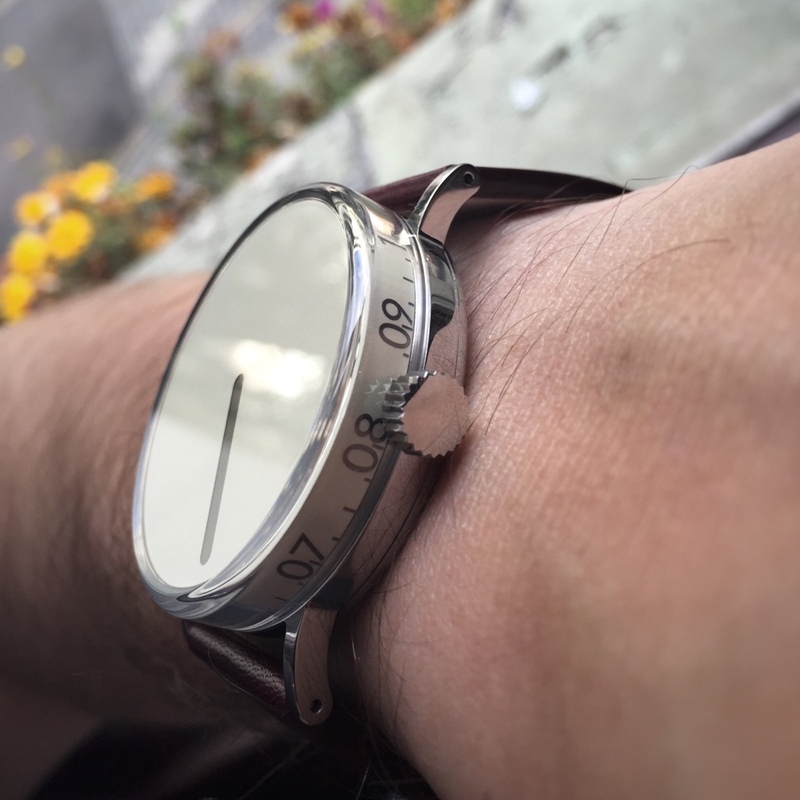 The single hour hand on top gives a rough idea of the time and for a more detailed idea of time, the hour segments are marked off around the side. I have to say, this is a beautifully engineer piece and we were all surprised to learn the crystal is machined from a single piece of sapphire! The transition from crystal to case is perfect and the watch wears very well at around 41mm. 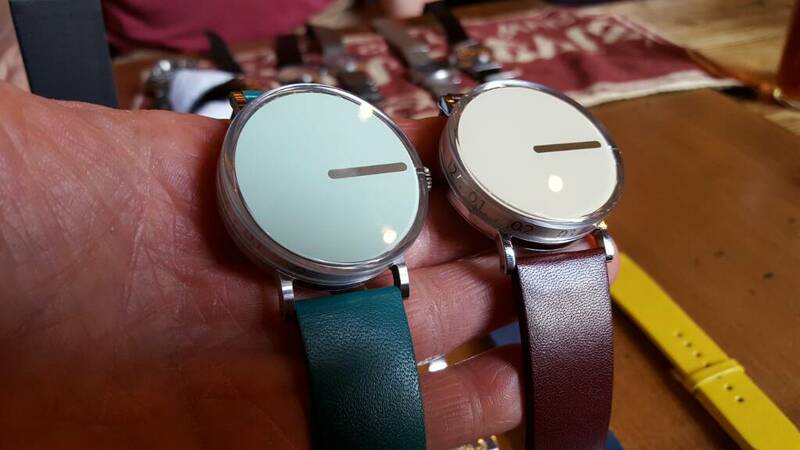 There are some good strap and dial colourways too. The engraving on the case back is very fine. Rogier also brought his other 2 models and like the Hourglass, are superbly engineered. I really liked the Porthole. The transition of screw in back and case, as well as crystal is flawless. The Inkpot had a very unique "crown" that pushed through the case to adjust date and time and winding was done from the bezel. The tolerances again were very fine. Rogiers engineering background very evident. Next up was the Ventus Black Kite. I really liked this piece. I was not able to back it on kickstarter so it was great to see it now and it's on the wish list for sure. The case is very interesting in carbon and has a lovely matt black finish. Sandwich dial was great, I liked the 'b' dial. It's very comfortable and light to wear. You can strap this on and forget about it and not worry about knocks with the tough carbon case. 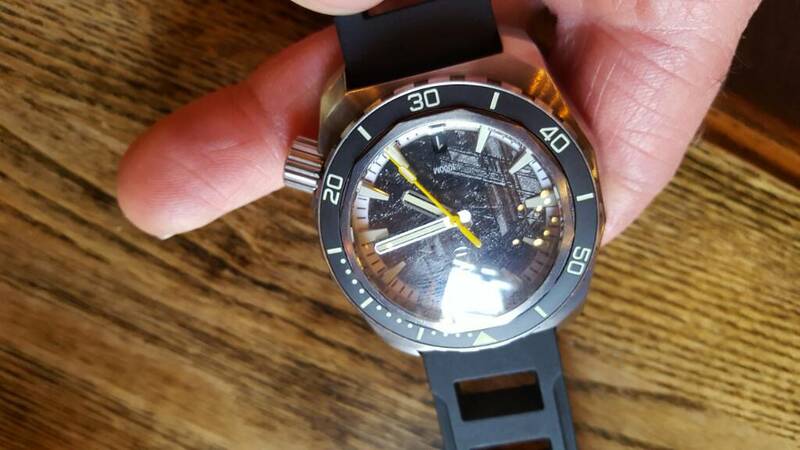 The Hammerhead, once we pryed it from Brad's wrist is a really great piece. Very deceptive. It looks huge but wears very easily. 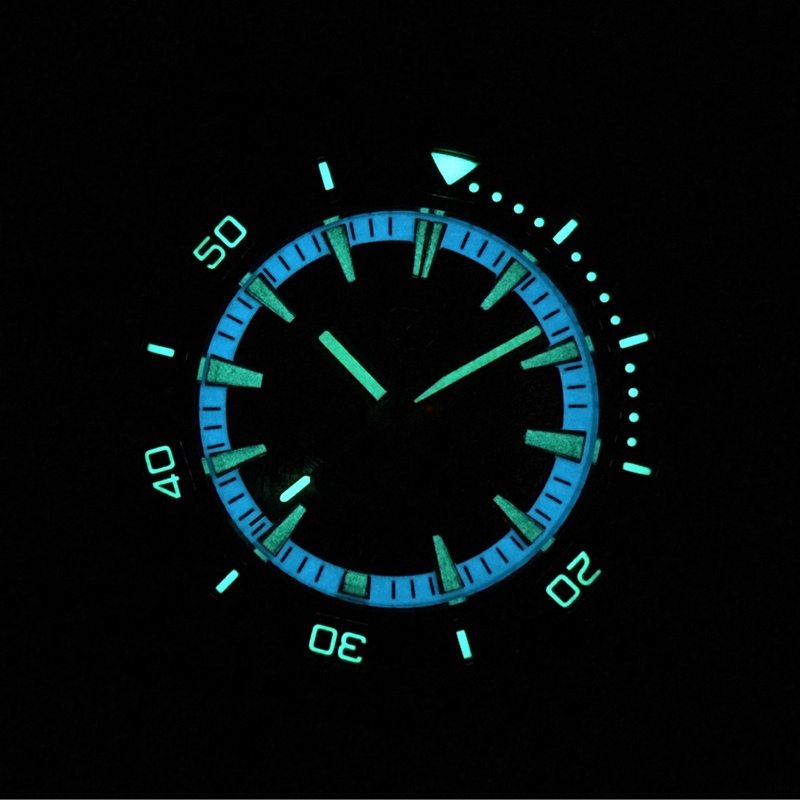 The crown at 4 makes for comfortable wearing and the lume logo is a fun detail. The mertiorite dial was awesome, first one I had seen in the flesh and it didn't disappoint. It's difficult to catch the appearance in the pics. The other Zelos, which model I have totally forgotten, sorry, was also a cool piece. The engineered case was very interesting. This is a very tall watch but again wears very well due to the short lugs. I only got this 1 pic though. The overall quality of these, and the Hourglass are superb. 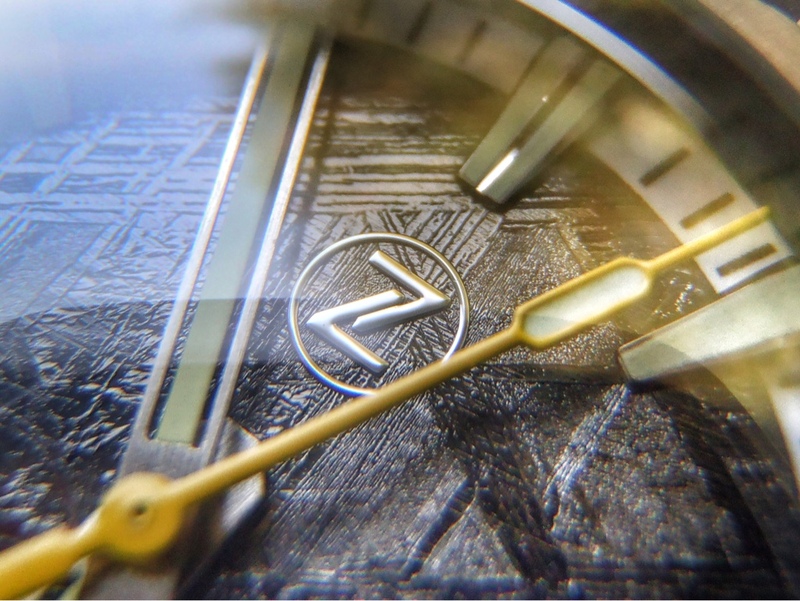 What is clear from both brands is the passion and enthusiasm for bringing diversity and innovation to the watch world. For me, you just can't beat some of the stuff coming out of these brands. The quality and diversity ratio is amazing and it puts a lot of the major players to shame. It does mean though that for those seeking something different, it is well worth supporting these guys. And for brands to be willing to send pieces for review at a gtg gives them vital exposure and really bridges the gap between product and consumer. A very cool move for Elshan and Rogier today. Thank again for the loan watches. (Brad, don't forget to send them back!). TapAptPat, catsteeth and Bergarn like this. The Ventus Kite was an interesting one. It's the first time I have handled a carbon case and I was impressed. 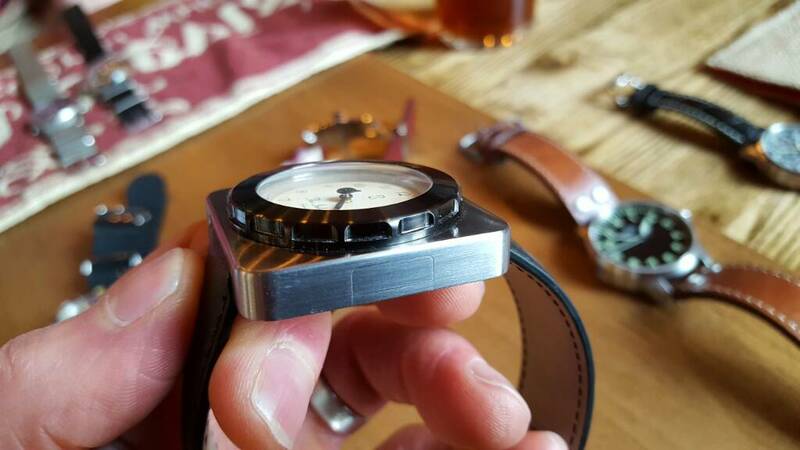 It was almost as light as I would expect a similar sized titanium watch to be which means that it is quite comfortable on the wrist. 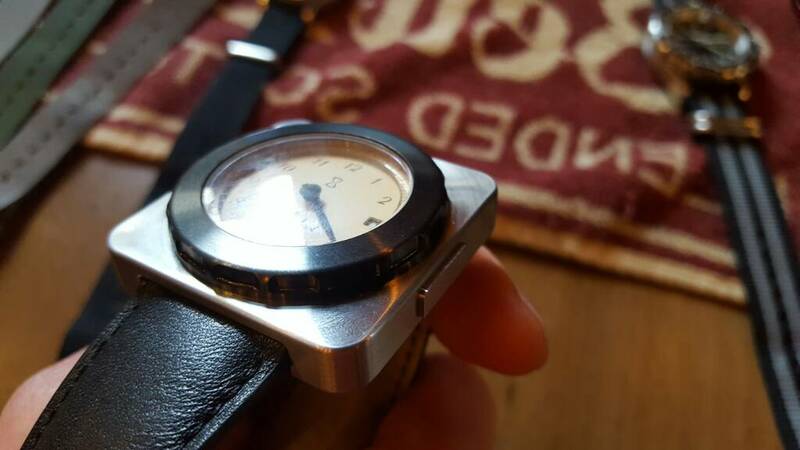 The lug to lug is a bit longer than I would normally wear but I could certainly get away with it on my 7 inch wrist. The patterns from the carbon are really nice and quite subtle. I don't generally go for fliegers or sandwich dials so it really isn't to my taste from that point of view, but it was well executed and I would certainly consider a carbon case in the future. The Zelos Eagle is a watch I have handled at a GTG before in bronze (or brass?) form. I believe the case is three pieces and I really like the construction around the lugs that comes from it. 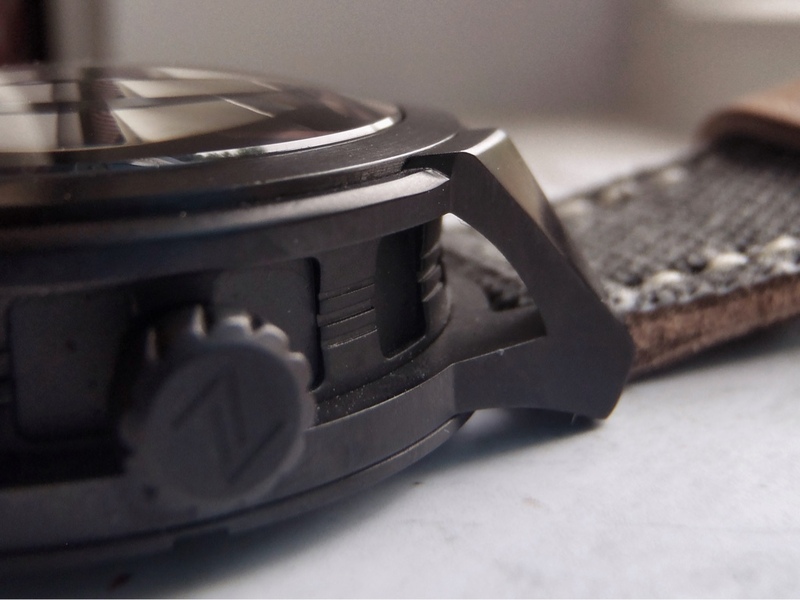 The contrast of the black and white on the dial is much more pleasing to me and a cross between the case of the Ventus Kite and Zelos Eagle would work really well for me. 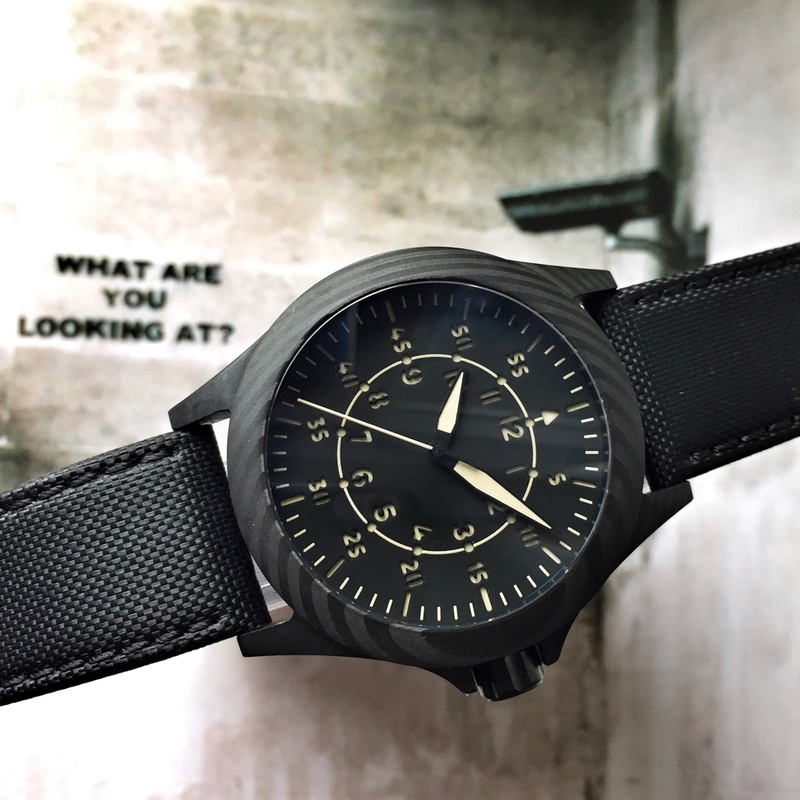 Even though it's a very tall watch it isn't uncomfortable at all, and if you're looking for a very well made, solid watch you could do an awful lot worse. 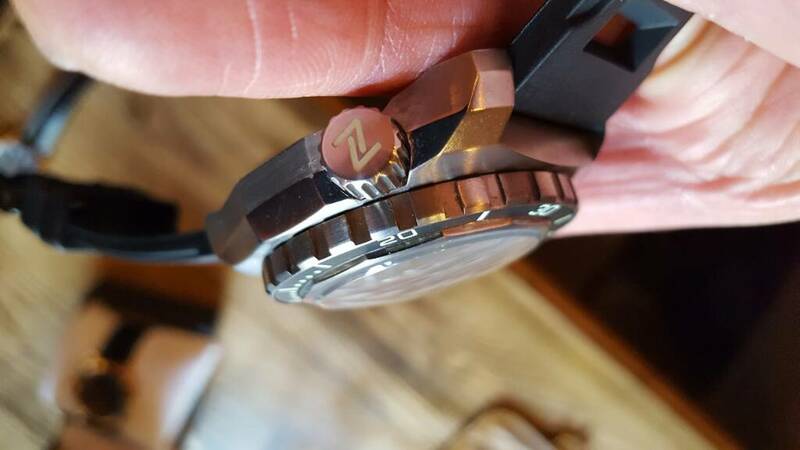 The common theme across all of the watches from Zelos that I've seen (we were loaned the Abyss and Chroma previously) is the quality. 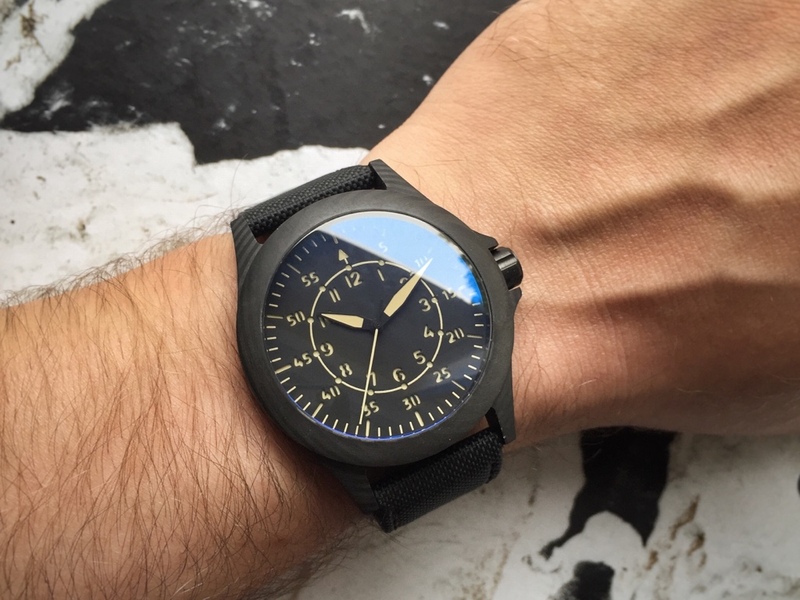 They look and feel like very well made watches. I think Jeremy has backed the Ventus brass diver that's currently on Kickstarter and if I remember the prices right it sounds like a bargain. I'll look forward to seeing that one next time. I will post my thoughts about the Hourglass later - I have many, many good things to say! Firstly I would like to echo Jeremy in thanking Rogier for making the trip from the Netherlands to London and for bringing his creations with him. I certainly enjoyed being able to learn more about the details of each watch, and I hope the day was helpful and enjoyable for Rogier too. - the dimensions of the hands which have the same width as the indices – and the cutouts in the hands are the same size and position as the lume inside the markers. However, the two things I wasn’t able to fully appreciate until I held it in my hands were the case shape and the level of precision in finishing. The case is completely smooth – the transition between case, crystal and case back is seamless. As you run your finger over the joins you wouldn’t be able to tell where one material meets the next; only that once your finger is on the crystal it feels slightly different, but there is no ‘lip’ or gap at all. 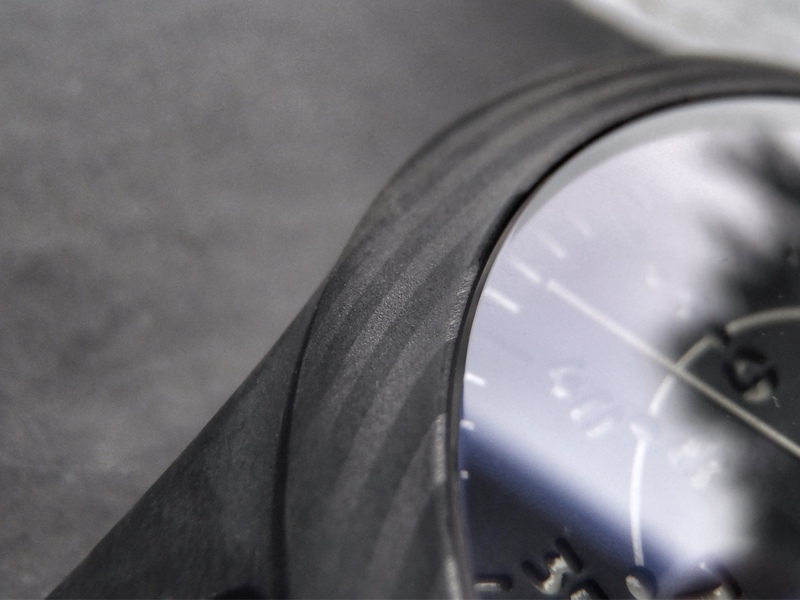 Each case is constructed and then hand finished to achieve this perfect transition. I would liken the feel of the watch to a pebble that has been slowly worn down over many thousands of years to become completely smooth. This case of the shape is also echoed in the crown – the exact same shape flipped 90 degrees. The next watch Rogier brought along is the Inkpot, which is still in the testing phase before it is ready to be released. The design isn’t to my taste, and I am too young to have used inkpots at school, but the engineering that has gone into the winding and setting mechanism really impressed me. 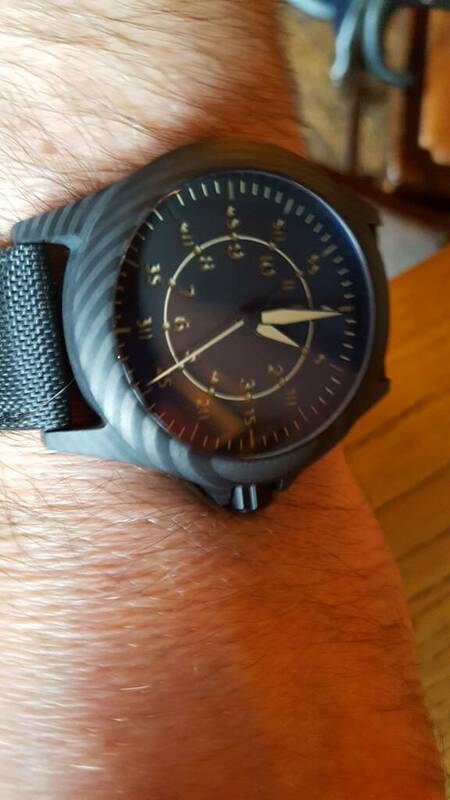 The inky black bezel rotates but has no markings and so isn’t used for timing. 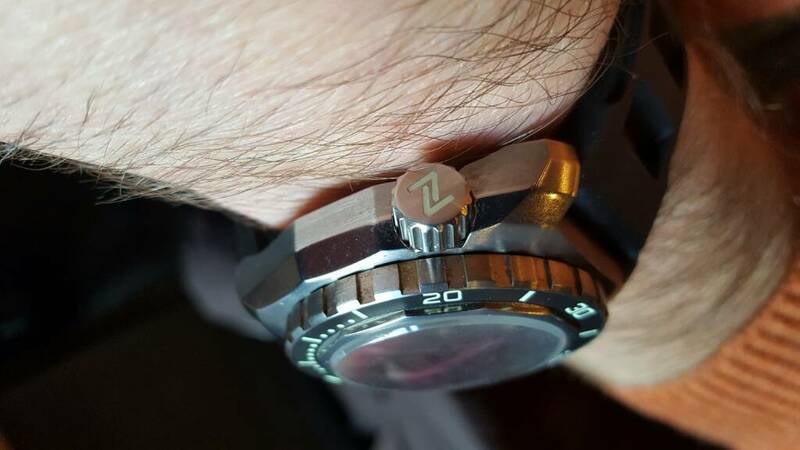 Instead, the bezel acts as the crown. 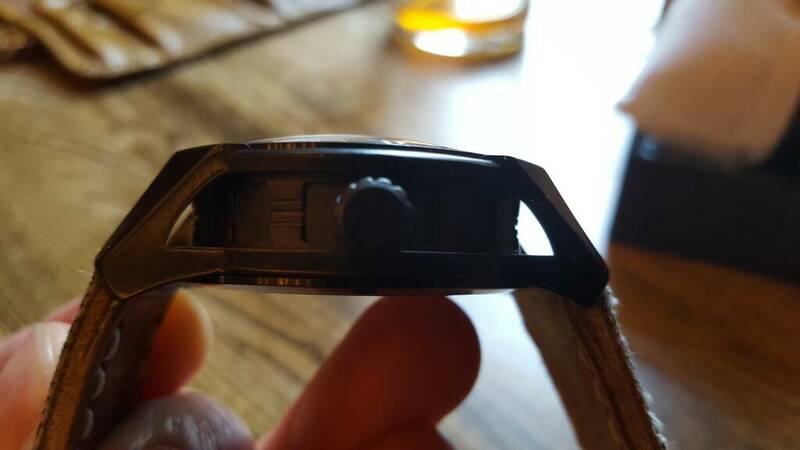 In normal use, rotating the bezel will wind the watch, and due to the gear ratios from the standard crown/stem arrangement to the much larger rotating bezel it won’t need much turning to be fully wound. The square case also hides the crown which can be seen in Jeremy’s photos above. 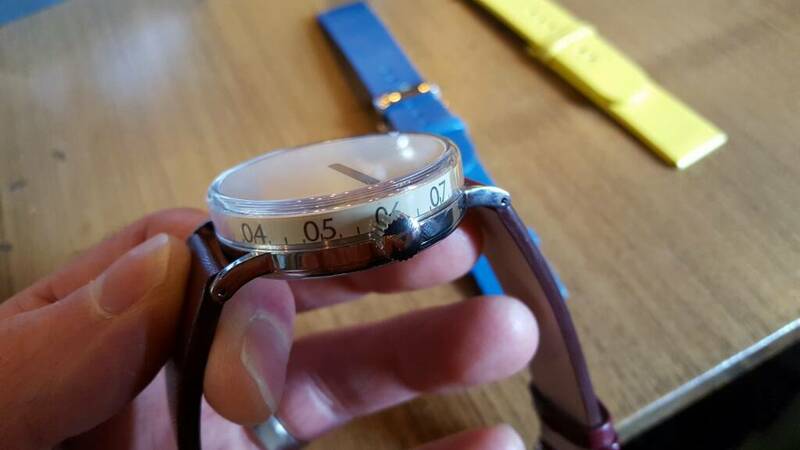 Once the crown is pushed to the ‘normal’ steps the bezel is then used to set the date and time. 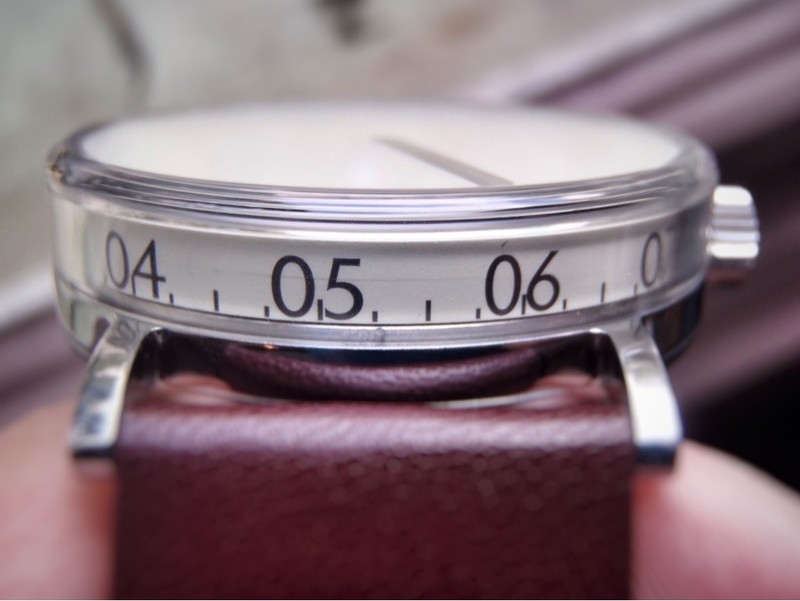 I really liked the way the normal crown can be done away with which helps keep the symmetry of the whole watch. Those two watches may not be to my taste, but the Hourglass certainly is. 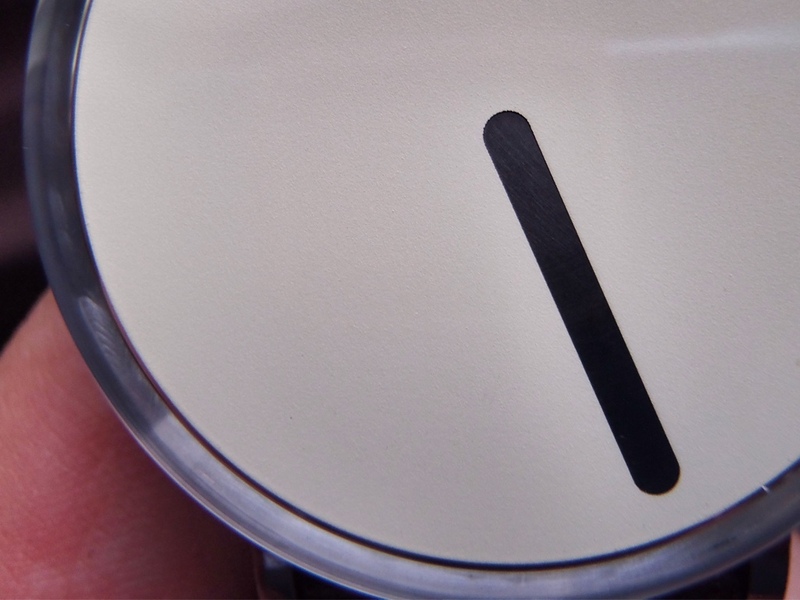 I really like the bold and simple dial when viewed face on, and the fact that the dial sits only a fraction of a mm below the sapphire crystal makes it look as though it is printed rather than a real working watch – a similar effect to the Ressence liquid filled watches, though obviously different in style. I know a lot of people aren’t fans of a lack of indices on a dial, though this is something that has never bothered me, but I will certainly concede that with a single hand watch (especially one with such a thick hand) a lack of indices will hinder the accurate reading of the time. The time-telling becomes an optional two-stage process. If a quick glance at the dial to see “it’s nearly 3 o’clock” isn’t good enough you can also then check where the hour and quarter-hour markers are lining up against a reference point between the lugs through the side of the crystal. Ok, you’re still not going to be super-accurate, but for many people it will be good enough. 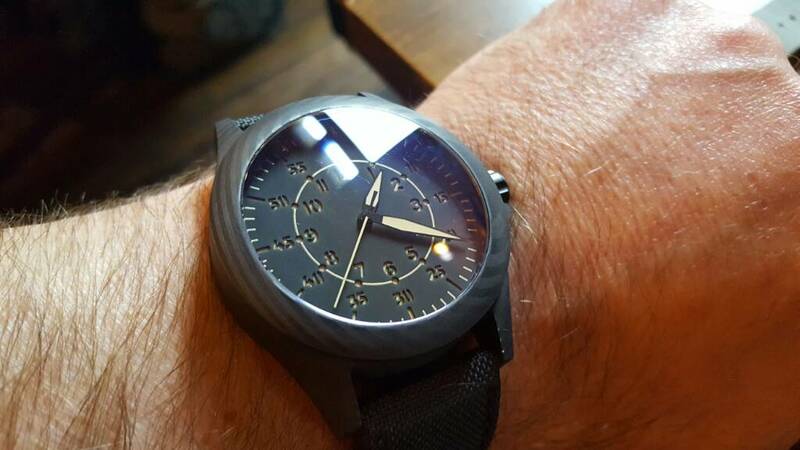 Rogier assured me that “it’s easy to tell the time within a couple of minutes” – he did also clarify that this meant you can tell the time to within a couple of minutes, rather than it taking a couple of minutes to tell the time. The two things that concerned me about the watch were both regarding the crystal. Firstly how it is structured and secondly how tall it will wear on the wrist. 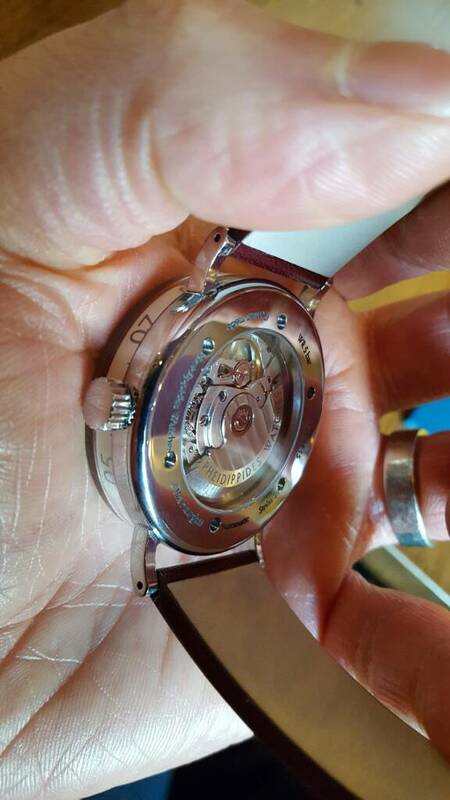 As Rogier explained the crystal is a single piece of CNCd sapphire and the disk/drum with the hour hand and markers sits 0.5mm below/inside it at all points. I was concerned the top edge would potentially become a weak spot and although my engineering isn’t enough to know where any stress points might be it looked and felt very well constructed. In terms of how tall is wears, I needn’t have worried. 12mm with vertical sides does sound potentially tall for a 41mm diameter watch but it didn’t feel tall when worn, and that height is needed to both promote the boldness of the design and to aid clear reading of the time through the sides of the crystal. The lug to lug length is 50mm which is slightly longer than I would have preferred for a 41mm diameter watch, but the lugs weren’t something I particularly noticed when the watches were on my wrist - which was a fairly regular occurrence throughout the day - so I would suggest they will work just fine on a 7 inch wrist. 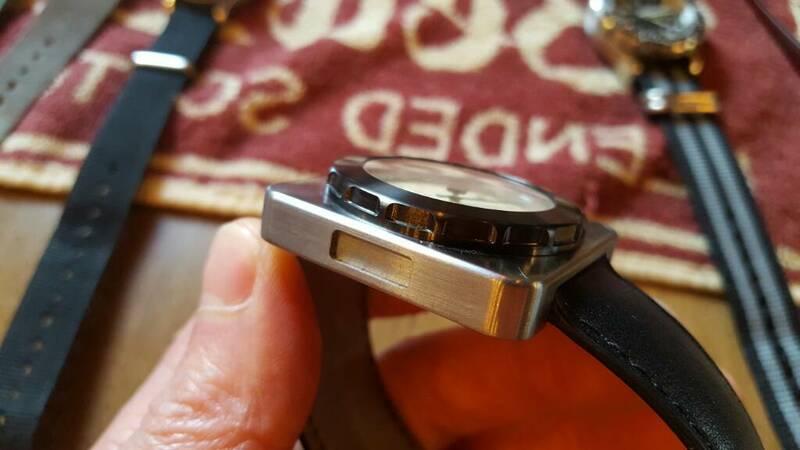 The lug width is 22mm, which is again probably not quite what I would expect given the diameter of the watch, but once again the lug width isn’t something which stood out as being odd. 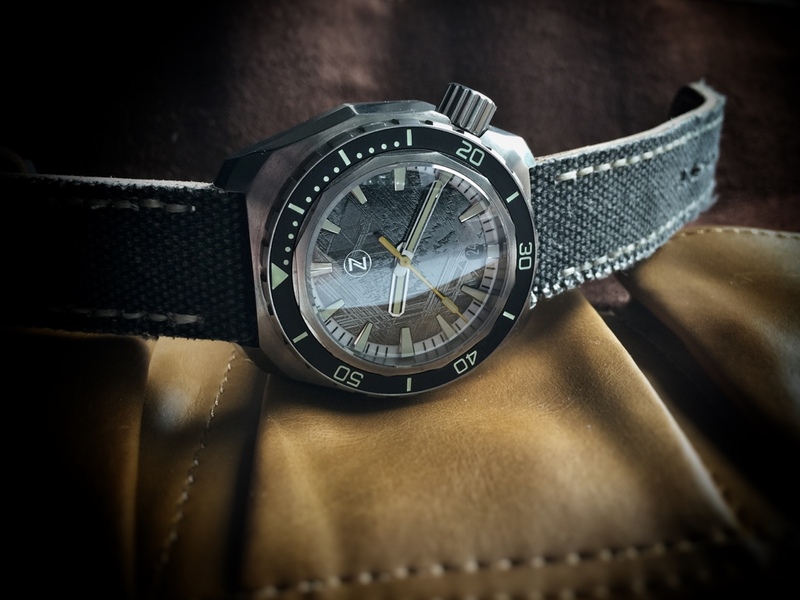 In fact, the slightly wide lugs coupled with the bold strap colours mean that the strap is probably more important to the design of the watch overall than is often seen. There are 5 pastel colours to choose from for the dial, and then 6 or 7 bolder colour choices for the strap to either match or contrast. Like the Porthole before, the transition from crystal to case it perfectly seamless and one thing I didn’t pick up on until reading the literature later that evening is that the curvature of the bottom of the case mirrors the curvature of the sapphire crystal at the top. 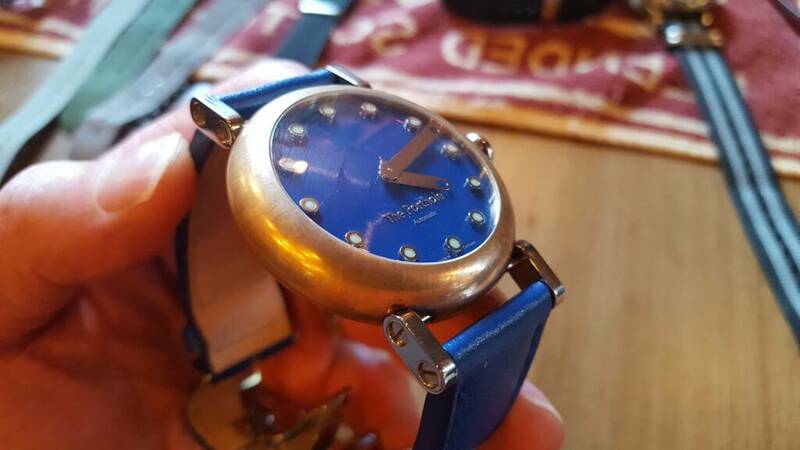 Another nice touch that shows Rogier is really committed to getting every aspect of the watch just right. Of the three prototypes that Rogier brought with him two had polished cases and one had a brushed case. I believe Rogier’s preference is for a polished case, but the brushed case worked best for me as I see this being a playful/casual watch. The case on the prototypes was standard stainless steel, but the production versions will be made with hardened steel in order to make the case almost as scratchproof as the crystal. The movement being used is the STP 5-15 which is one of Fossil’s new(ish) Swiss Made calibres aimed at offering a cheaper alternative to the ETA, Soprod and Selitta movements which also share similar specs (28,800 bph, 44hr power reserve and -0/+15 seconds per day). 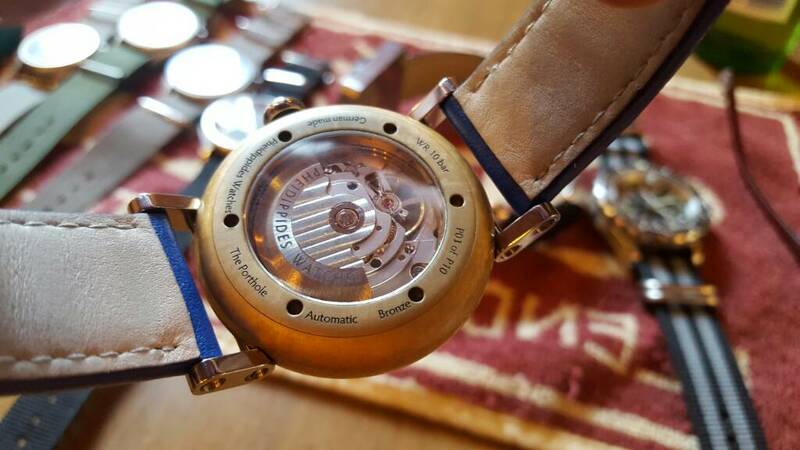 I haven’t experienced this movement first hand in any of my watches, but I have heard good things from those who have owned STP equipped watches. 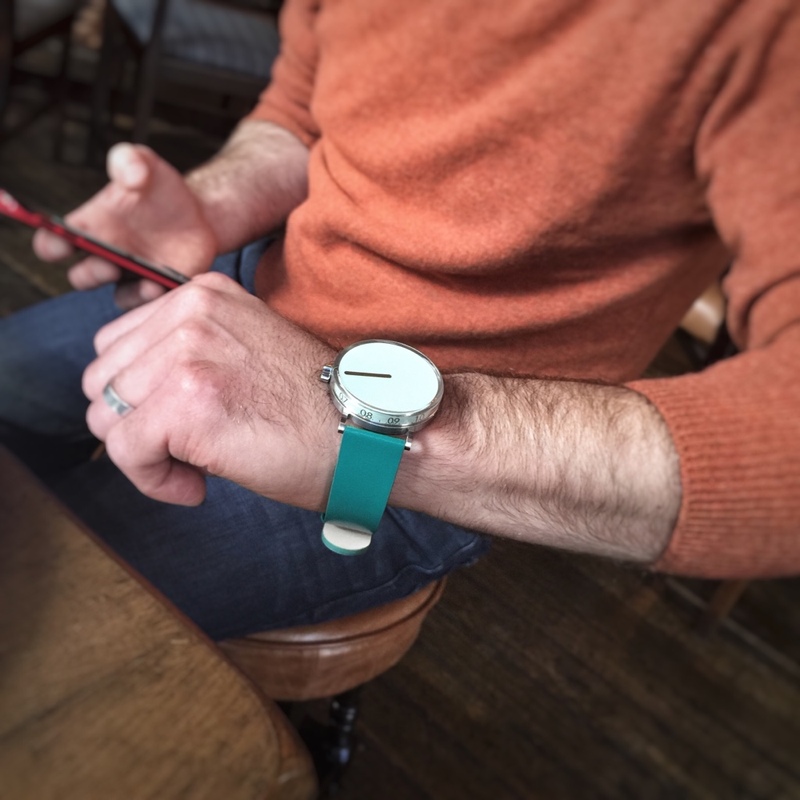 The watch was launched on kickstarter over the weekend, and the price is certainly higher than most others you will see on kickstarter. 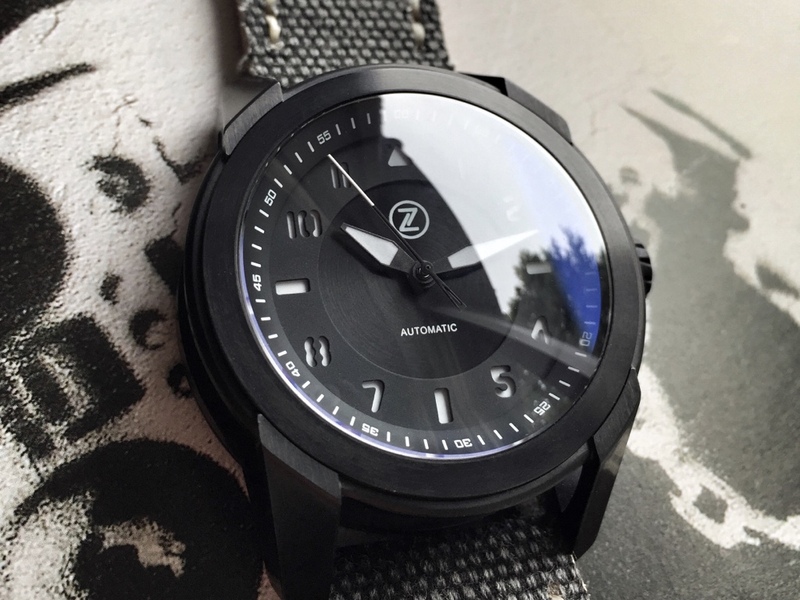 I’ve handled and owned several watches that have appeared on kickstarter and many of them have been pretty good quality for the price. 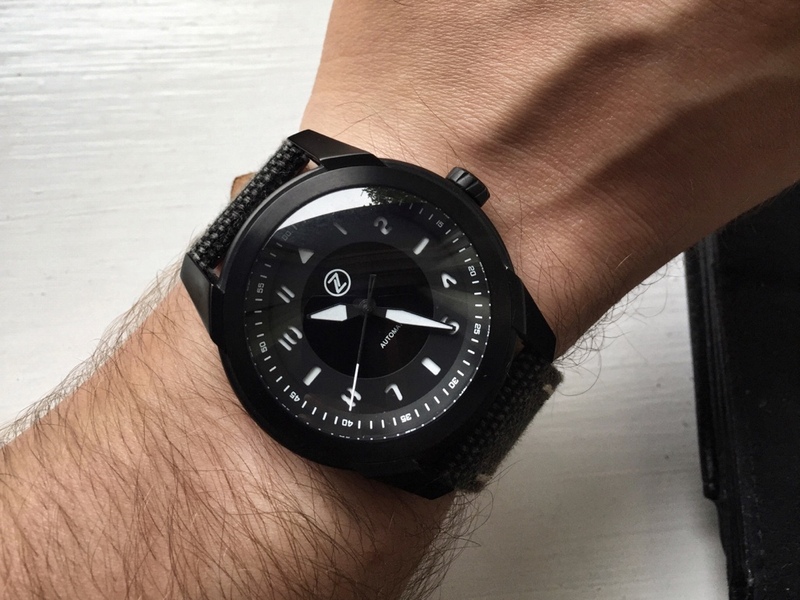 Although the price may seem prohibitive for what is essentially a ‘fun’ watch, the quality is up there with some of the best watches I have handled and I honestly believe it is good value. The kickstarter price is outside my comfort zone for a fun piece like this, but I am still working out what I can do/sell to let myself back it. Most of the photos above are taken from the Pheidippides website – apart from the one with Jeremy expertly modelling it on his wrist. I intended to take plenty of photos at the GTG but most of them weren’t all that good. Below are a few of my photos taken though, just to show how it looks in real life and on my wrist. Last edited by Bradjhomes; October 3rd, 2016 at 14:05. Thanks for your review. I am flattered. Indeed I enjoyed being with you guys and share our passion for high quality watches. micro brand watches lets see em! MICRO LOVE! 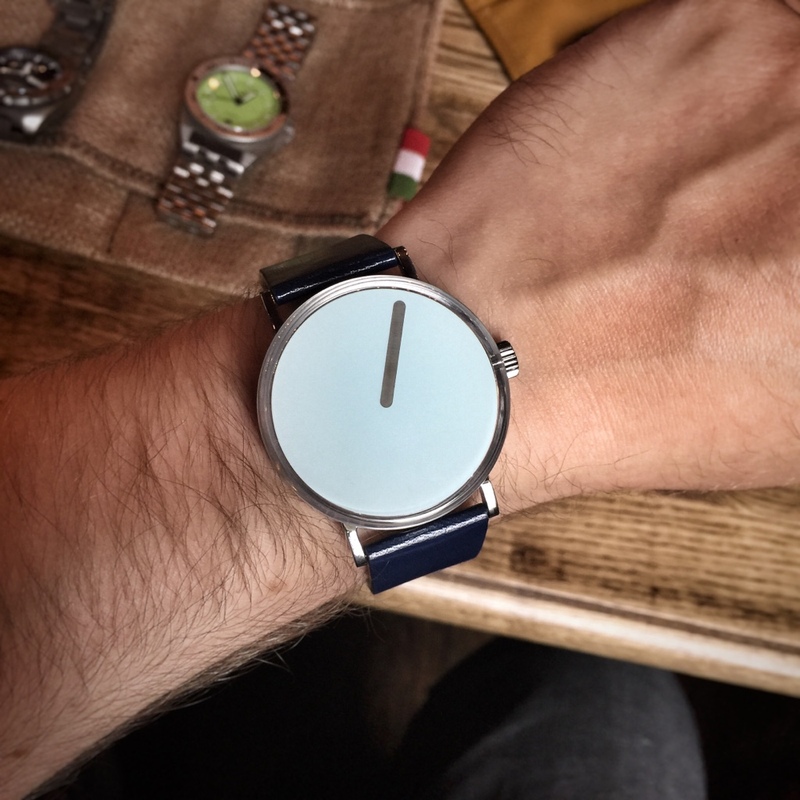 Any thin micro Brand Watches out there? Which micro-brand watches have increased in value? 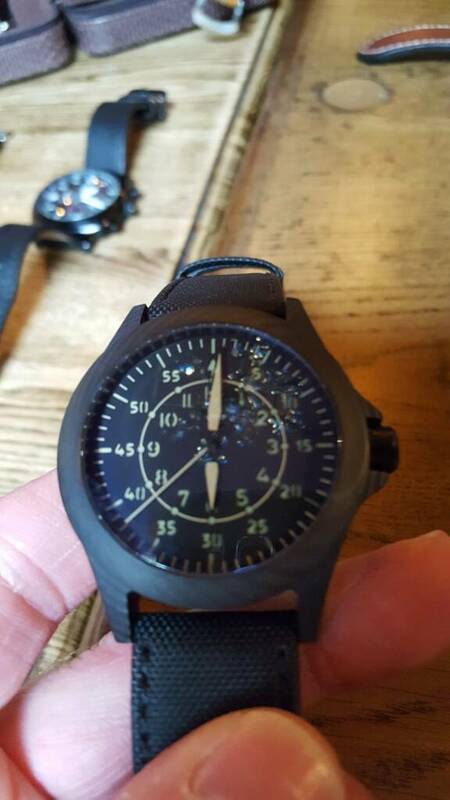 Are there any 42mm micro brand watches out there?